Kombucha is a delicious fermented drink you can make to supplement your diet with lots of probiotics and immune-supporting acids. The good news is that is requires little more than boiling tea and adding sugar, then letting it sit on your counter for a few days to a few weeks. Flavoring this fermented tea usually involves fruit or juice of some kind to make it crave-worthy, like a healthful, tangy, low-sugar Italian soda! But for some people working to improve their health, tea is simply out of the question. This could be due to dealing with oxalate sensitivity, for example. The oxalates (calcium crystals) naturally present in teas are a big no no for reasons like kidney disease, kidney stones, dental decay, recurrent muscle pain, spinal pain, chronic fatigue, Fibromyalgia, Autism, and other inflammatory conditions. Thanks to Leaky Gut Syndrome, oxalates find their way into tissues they do not belong, instead of being digested as normal and eliminated through urine or bowels. Ouch. Other reasons to avoid tea include: caffeine (trying to heal your thyroid or adrenals?? ), tea encouraging yeast growth within the body (eliminating tea is a basic for anti-candida diets; though this won’t be a trigger for everyone), or merely for sake of convenience (because sometimes we just don’t have time to boil water). Thankfully I’ve been brewing and teaching a method for those who want to or need to avoid tea for sake of their health: KOMBUCHA JUICE! 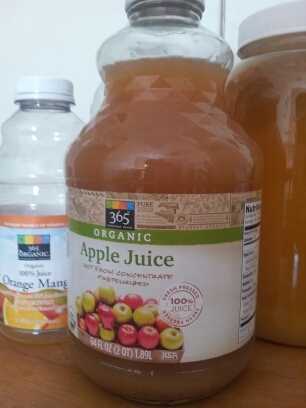 1 jar of organic fruit juice (Any size and any flavor you like. To keep it low oxalate, use peach, pineapple, apple, lemonade, limeade, papaya, etc. Finding juice in a glass jar works better so you can ferment right in the jar itself.) And don’t be afraid if the juice contains added sugar; it will ferment out in large part anyway. Note that I do not suggest using a super dark juice, like sour cherry, cranberry, etc. They tend to acquire a strange molasses type flavor that is not always pleasant. Just stick to lighter juices. 1 kombucha SCOBY (culture) I suggest using an “extra”. Meaning, don’t use your only SCOBY for this purpose. I keep a jar of extra/experimental SCOBYs; use one from there or when an extra grows on a new batch. And if you need help finding SCOBYs, I do sell these! Open jar. Pour out about a cup of juice into a separate glass, leaving the rest of the juice in the original jar. (You can drink this extra juice or save it for another purpose; we’re just trying to make a bit more room in the jar itself). Alternately, you can use a larger glass jar that will hold all of your juice and pour it all in there. Place SCOBY in jar. You should still have at least an inch of space between the top of the SCOBY and the top of the jar. (You need room to allow for carbonation and expansion). Seal lid tightly. Allow to ferment at room temperature for 3 days to 2 weeks. It will get less sweet and more tangy as time goes on. It will also produce carbonation the longer you allow it to sit. Make sure to come back once a day to open the lid quickly (without lifting off of the jar) to release pressure; if you don’t, you could have an explosion on your hands and that’s not what you want! 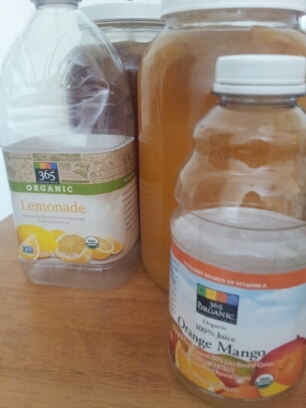 After the kombucha juice is flavored to your liking (less sweet, more sour, bubbly), place in fridge, drink and enjoy! Discard SCOBY or place into your experimental SCOBY jar. Note that sometimes a funky but benign yeast called Kahm yeast will grow on the surface of the kombucha juice (it looks white and bubbly). Kahm yeast is safe to consume, and isn’t guaranteed to happen. I find it often happens when I place a SCOBY directly into juice, but that the SCOBY will “eat”/neutralize it in a few days time. 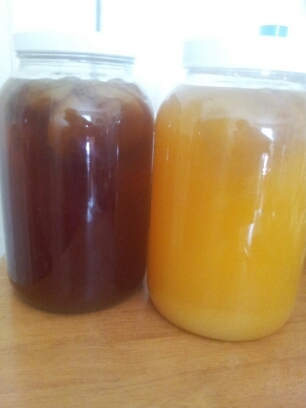 If your SCOBY does not neutralize it, it is still safe to drink. Wow! Kombucha juice ! This sounds really interesting and I am definately going to try this ASAP. Question: how come when you are fermenting you are using a sealed jar and not something breathable (as with regular Kombucha brew? That does sound delicious! However I would think fermenting juice, especially in a closed container would make the end result fairly high in alcohol. Have you tested it with a barometer? You can get them fairly cheap at brewery supply stores and online. I’m pretty sensitive to alcohol and it has not affected me. If someone is sensitive to alcohol you can simply allow it to ferment longer and the alcohol will dissipate. I don’t think this would be any different than the minimal alcohol in regular kombucha that uses white sugar.